A woman allegedly driving under the influence of drugs crashed her car Friday, then attempted to carjack other vehicles, according to the Morro Bay Police Department. At about 11:30 a.m., Searra Justine Crow, 24, was involved in traffic collision at South Bay Boulevard and State Park Road. Prior to officers arriving at the scene, Crow was reportedly trying to break into other vehicles, police said. Officers arrived and contacted Crow as she was walking away from the scene of the crash on South Bay Boulevard. As officers tried to stop Crow, she became combative, and police needed to restrain her. Officers arrested Crow on charges of hit-and-run and resisting arrest. 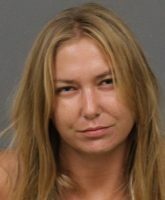 Police later determined she was under the influence of drugs and added a DUI charge. As the investigation continued, a female told police that Crow had struck her in the face twice with her fists while trying to take her vehicle. Police added charges of carjacking and battery and booked Crow into the San Luis Obispo County Jail. Crow remains in custody with her bail set at $25,000.